Kaenon was born in Bend on Wednesday, March 21, 2018. Born before his due date, he weighed 5 lbs, 6 oz. He was little, but his is parents thought everything was fine. He was about 5 hours old when nurses noticed during some tests that his blood sugar was way off. They soon realized he had some other major physical issues and would need to have surgery right away. Kaenon was immediately flown to Randall Children’s Hospital in Portland on March 22 and went into emergency surgery the next morning. The doctors did not know how severe the surgery would be or exactly what they would be doing until they got in there to see exactly what was happening. They discovered that his colon was emptying into his bladder, a very dangerous situation. And he had a few other issues that required surgery to repair. Kaenon’s first surgery went well. He’s had some very scary episodes since that time, but always pulls through! No more heart valve issues and his kidneys are now fine. He just recently had his 6th surgery and is recovering like the little champion he is! Due to the most recent surgery, Kaenon no longer has an ostomy bag. His colon and bladder can now function as they are supposed to. This is very exciting for his family as he grows and starts crawling and eventually walking. His mom and dad have been spending a lot of time in Portland with him and this is a huge financial burden for them. Neither one of them were able to work for the first few months after he was born as they cared for Kaenon. This has been a very stressful time for them… not at all what they imagined being first-time parents. Kaenon is such a sweet little boy and brings so much joy to his family. He is such a fighter! He’s had to endure so much since he was born, but with endless love and support from his family, friends, and the community… he’s going to make a full recovery and show everyone there’s just no stopping him! 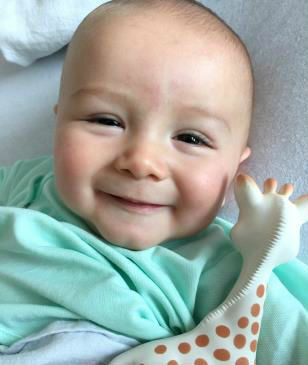 Sparrow Cash raised for Kaenon will help with ongoing medical expenses, including upcoming surgeries that he will need, and travel to doctor appointments in Portland. Students at Sisters High School will “earn” Sparrow Cash by completing a minimum of 256 hours of sponsored community service.